Cells A2, C2, and E2 contain the data I want to make my custom list for data validation. Cells B2 and D2 have data I don't want in the list (just text - "vs" - in them). So, I'm trying to use the following formula to get the custom list in G2. Whatever is entered in A2, C2, and E2 is what I want to dynamically become my custom list to choose from in G2. EDIT: Ultimately, A2 - G2 cells will be copied down (G2 containing the custom list of A2 - E2 without the "vs" cells being listed) and each row should act the same as above it but each dynamic and unique to their own. Any help is appreciated and alternative methods are welcome if they work! Not the answer you're looking for? 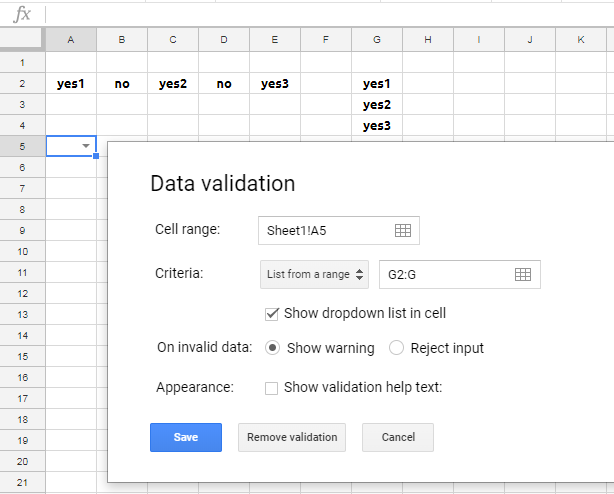 Browse other questions tagged google-sheets formulas data-validation google-sheets-data-validation or ask your own question.